Sewing with children can be an incredibly fun experience, just check out this post on Kids Design with Lady A. However something to keep in mind, is their comfort and safety. Sometimes, the excitement gets the best of them or maybe those little legs can not reach the pedals. So, it is important for them to feel completely ease and know some basics. Here is a quick tip to help those short little legs reach the pedal. Bring the pedal to them. That’s right, just by placing a stool under the pedal you are raising the height of the pedal and making it easier for them to reach. This way, they are not stretching or straining to apply pressure to the pedal. For older children consider putting a notebook or even better yet, use your phone book. You know that huge 5 pounder of paper that you will never look through unless the water heater breaks and you are in a pinch. 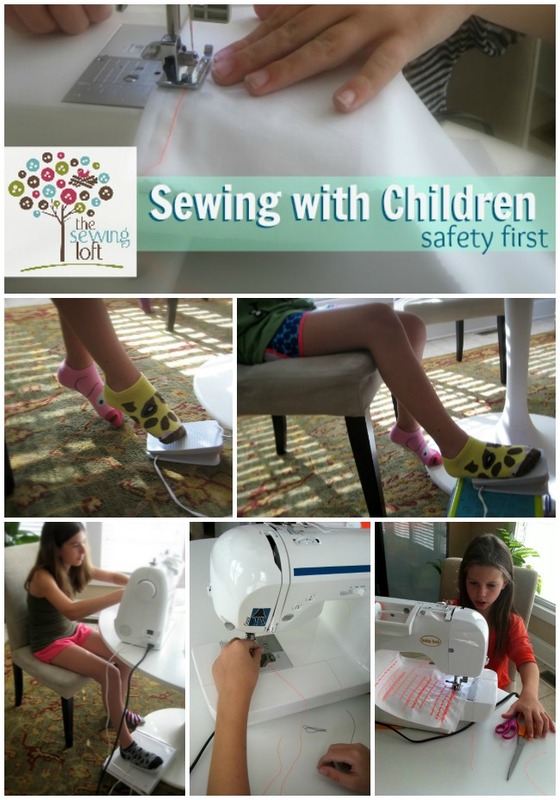 Introducing a child to sewing can be an amazing gift. You can see their eyes light up as they watch the thread take shape and transform the fabric in a finished project. Just be sure to help them thread the machine, remind them to keep their hands off to the side and above all have fun! I know that my girls are having a blast learning how to sew and are looking forward to making more fun projects. So, be on the look out for a few more sewing with children related projects this summer. My five year old loves to sew and I have to say I thoroughly recommend getting a fabric guide from the old singer machines – they make it really easy to get the seams neat. He struggles with the 1/4″ foot and achieved much straighter seams with the fabric guide. Great tips, Heather! Now if I could just bolt my machine to the table so they can’t move it around! I recommend that children wear eyeglasses when they sew in case a needle breaks and flies up. Most of my grandchildren wear correctional lenses anyway, but for children blessed with perfect vision a pair ofr safety glasses is a good idea. This goes for adults, too. This is a great tip Mary, protection is a must!